Do you recognise this photograph? 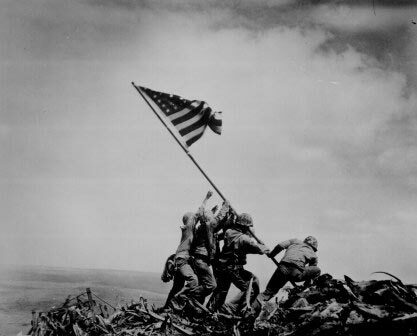 It was taken on Mount Suribachi, Iwo Jima, at 12.15pm on February 23, 1945. Joe Rosenthal used a Speed Graphic camera set between f8 and f11 with a shutter speed of 1/400th of a second. 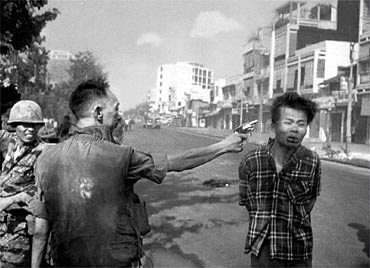 The picture earned him a Pulitzer prize and today, 68 years later, it is still reckoned to be the most reproduced photograph of all time. It has even been recreated in bronze as a memorial to the US Marines outside the Arlington national cemetery in Virginia. Rosenthal was working for the Associated Press and was one of two professional photographers (the other was from Newsweek) on the little island with the Marines at this key moment of the Second World War. Within 18 hours the picture was being published in hundreds of newspapers across the world. If you read a newspaper or look on the web and have any interest in finance, pensions, care homes, property, heating bills or social benefits, the chances are that you'll have seen it at least once. SubScribe can't help with the photographer or the circumstances of the session, other than that at least one other picture was taken and distributed. 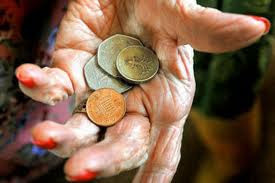 The picture has a certain elegance: the slim wrinkled hand, the long fingers undistorted by arthritis, the manicured, painted nails that suggest a more privileged life in the past. But it hardly captures a moment in history. Yet it has been used in papers and on websites over and over again. Since 2009, the Sun and the BBC have each used it four times, the Guardian and Huffington Post six. I've placed it myself in The Times, as have my successors. ITV.com and the Express are really in love with it. They've used it 15 times apiece - three times in three weeks in March last year, in the case of the Express. So what's so special about it that it has such constant and universal appeal? You'll have seen this one - or a version of it - too. The street of estate agents' boards must be the ultimate in stock shots. House prices are of great interest to many people (almost as great and almost as many as the Express thinks) so stories about them going up, down or even stabilising eat up forests of newsprint. And they have to be illustrated. Unless you have a willing case study, it's complicated to find a specific house to photograph, so we all fall back on the boards or bunches of keys. It gets a bit tiring after a while - and telephone codes change, estate agents merge or go out of business, so the pictures need rethinking, reworking or at the very least updating. For that you have to have a photographer. And photographers cost money. Much cheaper to stick with the agency shots and take what you're given. Stock shots have their place. They are readily accessible and a godsend when you have a difficult subject to illustrate, but they have no place in live news stories where the reader wants an image of the event. If you use one in such circumstances it is tantamount to admitting that you missed the story, got to the scene too late - or didn't have anyone to send. 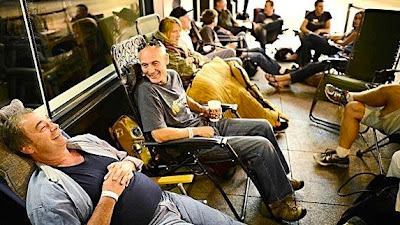 The picture above shows how the Chicago Sun-Times presented the story when people queued round the block for a freebie chickenburger. The picture below, of customers waiting outside the diner, is the rival Tribune's effort. OK, so it's not the liveliest of pictures, though the two men in the foreground have charm. But at least it was taken on the spot and isn't a handout picture of a burger. The reason for the difference has been well documented - the Sun-Times sacked its entire 28-strong picture department at the end of last month with the explanation that online readers wanted more videos and so big changes were necessary to facilitate that. But what about still pictures? Ah, reporters with iPhones and agencies would have that little problem covered. The decision has been greeted with alarm and astonishment on both sides of the Atlantic. Which is apt because it is alarming and astonishing. A newspaper/website without a picture department? How can that work? How can any organisation lay off the likes of the legendary John H. White, below? White, 68, had worked at the Sun-Times for 35 years, and also taught photojournalism at two colleges. 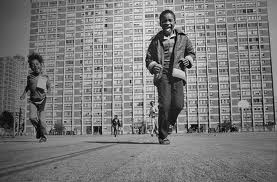 In 1974, at a time when race issues were still explosive in many parts of America, he was commissioned by the Environment Protection Agency to document the lives of African Americans who mainly lived in the deprived areas on the south side of the city. The community that emerged from his photographs was undoubtedly struggling, but it was also one capable of exuberance and grace. The White trophy cabinet also houses the Chicago medal of merit, five photographer of the year awards, three headliner of the year awards. He was also the first photographer to find a place in the Chicago journalism hall of fame. A shining star without doubt, but not the only one in the constellation. The scale of what the paper has thrown away is laid out in this article from American Photo magazine. Chicago (as seen by White, above) regards itself as America's second city. 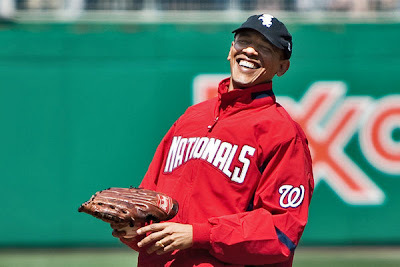 A lot happens there - it's the world of Al Capone and of Barak Obama. History has been made there time and again, and local photographers have been there to record it. Not any more. Of course there are always agency photographers - Joe Rosenthal who took the Iwo Jima picture was one - but if you rely on them you are never going to have an exclusive on your own patch. And when you have a powerful rival like the doorstep like the Tribune, that's a risky position to put yourself in. In the era of point-and-press megapixel cameras, we all think we're photographers; we share our efforts on Facebook and some of them are not bad. But we haven't been trained to choose the right angle, the right exposure, to judge the right moment as professionals have. Nor have the Sun-Times reporters. It's bringing the DIY mentality into the professional arena. How hard is it to wield a paintbrush to brighten up the spare room? Not hard, but someone who has served an apprenticeship in painting and decorating will do the job far more effectively - and economically - than the home handyman. Once again, newspaper managements are devaluing the talents of their staff, discarding trained experts because they think they can get someone else to do it more cheaply. It's a flawed strategy. 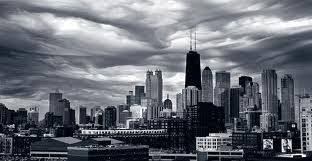 The Chicago purge is an extreme example of economies being enforced all over the place. One national newspaper picture editor told me three or four years ago that the picture budget - including cartoons, drawings etc - for an entire department was £11 per day. Yes £11. Ok, this was on top of the subscriptions to the big agencies, but buy one mugshot from Alamy and he'd have blown two weeks' cash. The result, I was told, was that he had researchers on the phone all day begging company PRs for pictures. That's why we pay specialists? To beg to PRs? This approach is hard enough to comprehend in the context of newspapers, but when you think in terms of the digital age, it's bonkers. Websites and tablet editions are voracious consumers of pictures. Where a newspaper might have one or two per page, the digital versions require an image with every story. The demand for original photography will increase rather than diminish in the new era. How many times does an online reader want to see the same mugshot or stock photo? 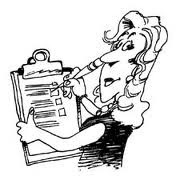 The alternative, if there is an objection to paying agency fees, is the PR handout. These are already rather too much in evidence in so-called serious papers, particularly if they feature a comely woman. Here's Liz Hurley doing X or Pippa Middleton doing Y. Some papers have gone so far down this road that they can't even pick up on widely available agency photographs of true merit. Last Sunday the Moon was as close to Earth as it's going to be this year. Quite a sight. The Guardian treated readers to a splendid centre spread, the Independent also pushed the boat out. But you had to struggle to find even a single photograph in the other papers and some were so tiny and hidden in corners that they were barely distinguishable from the adverts. Pictures of Gwyneth Paltrow in her underwear (above in Friday's Telegraph) preparing for a film or Glastonbury preparing for the crowds were, of course, so much more important. If we've come to the point that we can't recognise special natural phenomena because we're so bound up with our 'up with the kids' news agendas, what hope is there for the spot news picture? And who's going to take it? Let's go back to Chicago and Obama, reminding ourselves that this is the city in which he built his power base and is therefore the city that holds the key to elements of his personality, for example the White Sox fan pictured above. The home town papers need to be on the case take the opportunity to archive off-duty and off-beat moments that may have little significance now, but prove important or illuminating in decades to come. Here's an example from the Thirties. John Dillinger was a bank robber who, largely on account of escaping twice from jail, became America's first Public Enemy Number One and eventually met his end at the Biograph Theatre near Lincoln Park in Chicago in July 1934. On a cold January day in 1934, my grandfather shot John Dillinger. Sol “Dixie” Davis steadied himself in front of the notorious bank robber, aimed his Speed Graphic 4-x-5 camera and took a picture. Dillinger, who was handcuffed and under police guard, let him take a few more photos and then said enough. “Taking these pictures’ll drive me screwy,” Dillinger said. Dillinger was not in a good mood. He and members of his gang had just been captured in Tucson, Ariz. My Grandpa Sol, a photographer for the Chicago Daily Times, was riding in a plane with America’s most wanted fugitive. 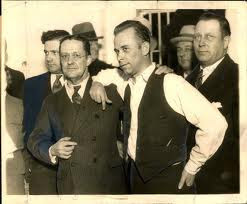 He got a tip that police were bringing Dillinger to Chicago and would stop in St. Louis to change planes. He drove down to St. Louis to get on that plane, and bought up all the empty seats so no other reporters or photographers could get on. “Mr. 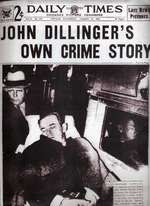 Dillinger,” Sol said as he walked up the aisle after the plane took off. “Whaddya want?” Dillinger asked again. This is the resultant front page of the Daily Times, a forerunner of the Sun-Times. To get a great news picture, you not only have to be in the right place at the right time, viewing from the right angle, but also have the experience to be aware of unexpected movements in your peripheral vision. If you are reporting on a story, you should be so busy focusing on what someone is saying that you will likely fail to spot what they - or anyone else - is doing. Not only that, to get that memorable shot you almost have to take the picture before the action starts. Anticipation and instinct are everything. But even if our reporter has them, how can he or she respond to the visual? It would be the height of bad manners to interrupt the conversation and hold up an iPhone to grab a picture. No doubt the Sun-Times has done the calculations and concluded that its picture department is costing too many thousands of dollars for every exclusive photograph. In case other news organisations are planning to follow Chicago's lead, here are some instances of professional photographers' work that have not only impressed the reader, but also changed our view of the world. Vietnam, 1972: Children flee napalm attack. 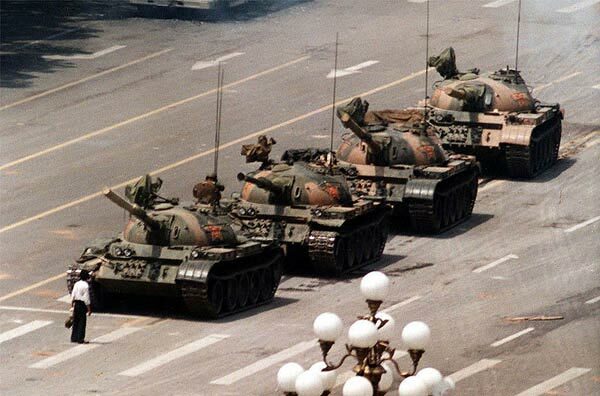 Beijing, 1989: The 'unknown protester' defies tanks in Tiananmen Square. For those with any kind of interest in newspaper photography, presentation and the importance of pictures, to my mind the bible is still Harry Evans's Pictures on a Page from 1978. It may sound antedeluvian, but there are a few managements and editors who could benefit from giving it a read. Thanks to CatbeL8 for four suggestions: the eruption of Mt St Helens in 1980, the Boeing 767 flying into South Tower of the World Trade Center on 9/11,and these two examples of anticipation, instinct and quick thinking. John F. Kennedy Jr salutes as his father's coffin passes on November 25, 1963. It was his third birthday. The photograph was taken by Stan Stearns of United Press International. He had frequently covered Jacqueline Kennedy and so knew her habits. Stearns therefore had his lens trained on Mrs Kennedy as the funeral cortege approached. He saw her bend and whisper to her son and suddenly the boy raised his right arm. 'The hand went up. Click - one exposure. That was it. That was the picture,' Stearns told the New York Times. Stearns died, aged 76, in March last year. 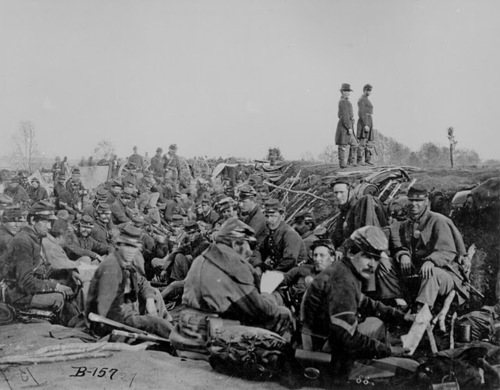 CatbeL8 also recommended Matthew Brady's photography from the American Civil War. There are many graphic images from the battlefields and the trenches. This one, from Gettysburg in 1863, is the sharpest and least gruesome I found, while still showing the abject misery of war. Well said, Gameoldgirl. The day we lose professional news pictures is the day we discard an important eye on the world. Great idea pursuing the historic past through photos. Today thru the 3rd is the 150th anniversary of the Battle of Gettysburg. Matthew Brady established news reporting and war reporting with his camera.